Kathleen M. Rodgers' stories and essays have appeared in Family Circle Magazine, Military Times, and in many anthologies. Rodgers was named a Distinguished Alumna from Tarrant County College/NE Campus. Three of her aviation poems from the book Because I Fly (McGraw-Hill) were featured in an exhibit at the Cradle of Aviation Museum on Long Island, NY. In 2017, the Clovis Municipal School Foundation in Clovis, NM awarded her the Purple Pride Hall of Honor Award under the "Sports and Entertainment" category. Seven Wings to Glory, Rodgers’ third novel, deals with racism and war and won an Honorable Mention for War & Military in the 2017 Foreword Indies Book of the Year Awards and was shortlisted for the 2017 Somerset Awards. Her second novel, Johnnie Come Lately, won a 2015 Gold Medal for literary fiction from Military Writers Society of America & 2015 Bronze Medal from Readers' Favorite. Thorndike Press, the leading large print publisher in the U.S. released Johnnie Come Lately and Seven Wings to Glory in hardcover large print 2018. Rodgers is also the author of the award-winning novel, The Final Salute, featured in USA Today, The Associated Press, & Military Times. She and her husband, Tom, a retired USAF fighter pilot/commercial airline pilot, reside in North Texas with their two rescue dogs, Denton and Jav. The mother of two grown sons, Thomas and J.P., she is working on her fourth novel set against the backdrop of the 2016 election. Her future work is represented by agent Diane Nine of Nine Speakers Inc. The Final Salute is a military fiction by Kathleen Rodgers. Colonel Tuck Westerfield, a fighter pilot at Beauregard Air Force base who flew in the Gulf war, mourns the death of his friend and colleague. His unhappiness rises after catching his Commanding Officer cheating with another officer, as his boss constantly threatens him. Gina, Tuck’s wife, worries about his moodiness, which the neighbour’s dog provokes; and Michelle, her rebellious, gothic-attired stepdaughter who visits. Tuck travels down Memory Lane, reliving his childhood while remembering his friends and colleagues who died courageously, and wonders why life deals such blows. He is assigned to the Middle East after Iraq invades Kuwait and his experiences there make him more determined to consider adjustments to his life if he survives. 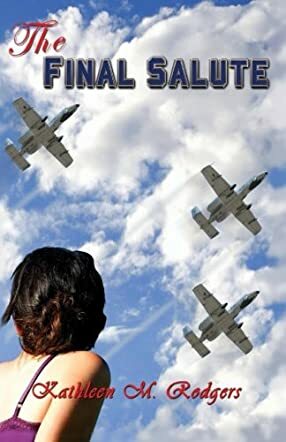 Kathleen Rodgers has created an engrossing military fiction appropriately called The Final Salute. She gives a very realistic account of what life is like in the air force, both from those who serve and from their family members’ point of view. It is an intriguing story that has so many emotions as the diverse characters express their joys, fears, pains and sadness in different ways. The author also demonstrated quite nicely how a few military careers may be tarnished and how some scandals or other conflicts are quickly covered up. The Final Salute is a book I did not want to put down, and I think Kathleen Rodgers writes descriptively and with compassion. She shows readers another side of military life in an original and interesting format.